Editor’s Note: This is the cover story in the April issue of RISMedia’s Real Estate magazine. Name something, anything, that’s of top concern to a broker operating in today’s market, and Leading Real Estate Companies of the World® has it covered. Competitive differentiation? On it. Consumer analysis? Got it. Cloud technology? Check. Global reach and luxury expertise? Done. 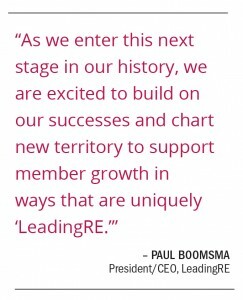 As the network transitions to its new, highly-skilled leadership team headed by President/CEO Paul Boomsma, LeadingRE has never been better positioned to champion independent brokers and solidify their place in a rapidly changing real estate environment. 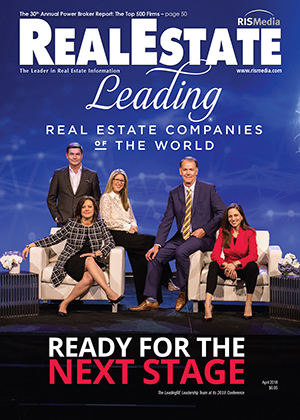 Whether it’s competition from traditional franchise brands or the new class of real estate disruptors, LeadingRE has stepped up its offerings on every level to enable its members to keep growing and succeeding. 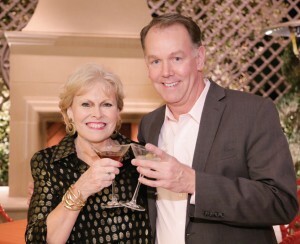 Pam O’Connor and Paul Boomsma toast the future of LeadingRE. 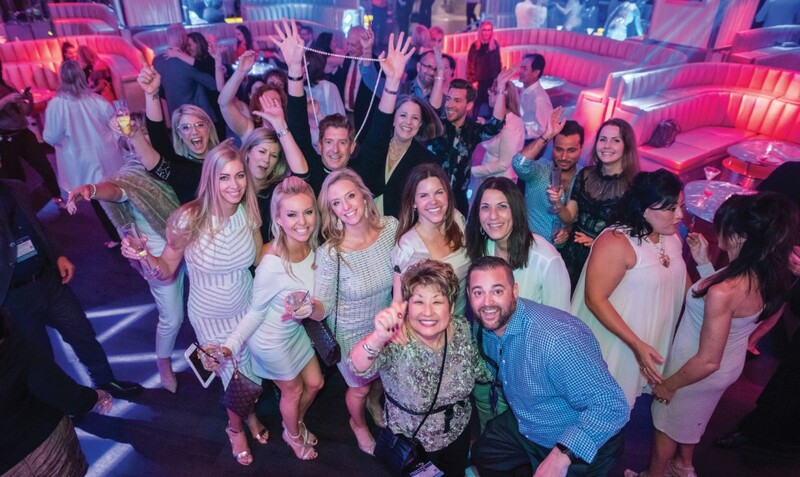 There are many factors that have been responsible for LeadingRE’s success—and many more that will be critical for its next phase—but none more important than its members. Built by brokers and run by brokers, the network’s cadre of invitation-only member firms serves as a unique competitive advantage on today’s often homogenous real estate playing field. This distinction defines the members that comprise the LeadingRE network. “We look for top-ranked brokerages in their respective markets because those companies are characterized by great leaders,” says Boomsma. LeadingRE serves as a hub to 565 independent firms in 70 countries around the world, representing 130,000 sales associates. LeadingRE’s model supports members in doing what they do best—deploying their talent in the local real estate market—while LeadingRE takes care of delivering complimentary services that enhance their business and a powerful global network connecting them to buyers and sellers around the world. This preference was clear in the results of a LeadingRE-commissioned survey of more than 3,000 U.S. homeowners, conducted by McKee Wallwork + Co. and Decision Analyst, with more than 88 percent of respondents saying they preferred working with an agent from a “well-known, local real estate company,” while just 12 percent preferred those affiliated with a national franchise. A critical strategy woven into LeadingRE’s DNA is the continuous development of its strong global network. Today, the network boasts members in 70 countries around the globe, including the recent additions of Monaco, Ghana, Vietnam, India, Japan and Thailand. “We have a passion for connecting like-minded, local market leaders and have extended that reach to six continents. 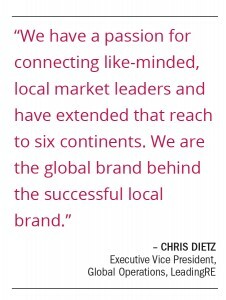 We are the global brand behind the successful local brand,” says Chris Dietz, executive vice president of LeadingRE’s global operations. LeadingRE members are automatically given powerful worldwide exposure and the distinction that comes from co-branding with LeadingRE. To become a competitive global network, having a powerful presence in the high-end market is essential. Luxury Portfolio International® is a vital pillar of the LeadingRE model, with strategic channels for reaching affluent consumers, including its award-winning website, luxuryportfolio.com, which last year marketed over 50,000 $1 million-plus properties around the world. In order to help members stay competitive in the luxury arena, Luxury Portfolio carefully monitors trends. To that end, Luxury Portfolio recently released a groundbreaking trend report, “The Rise of the New Aristocracy,” which tracks a critical shift in this elusive demographic. 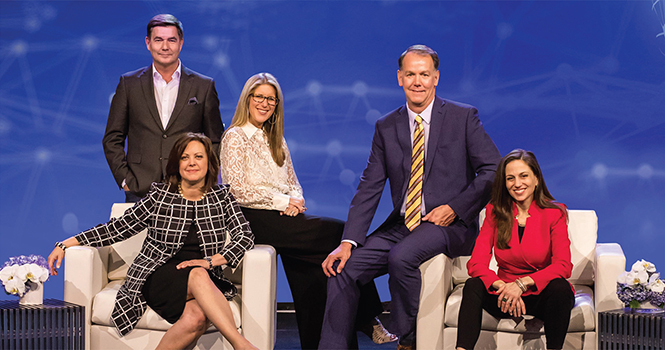 Whether it’s the Luxury Portfolio division or the global growth of the network, LeadingRE continues to keep the network a step ahead by providing a menu of cutting-edge tools, training and resources, all designed to help members deliver the best possible value proposition to agents and consumers. 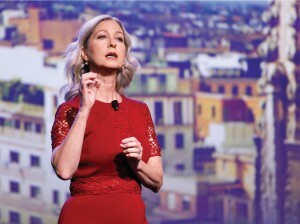 LeadingRE Chief Economist Dr. Marci Rossell addresses the conference audience on global economic trends. LeadingRE also sees itself as a learning organization committed to elevating performance through educational resources for its members, both at the agent level and for leadership. This is evidenced by its No. 1 ranking on Training magazine’s 2018 Training Top 125 list for organizational learning and development excellence across all industries worldwide. The network’s Institute, an online learning program with more than 350 proprietary courses, its world-class conferences and its MAESTRO Leadership Program played key roles in achieving this high honor. Of course, remaining competitive also means staying ahead of the curve in the tech realm. To that end, LeadingRE recently announced the LeadingRE Cloud to empower members to connect with the most innovative technology as efficiently as possible. To ensure that edge, LeadingRE is also investing in Moderne Ventures, an investment fund focused on early-stage technology companies in the real estate space, so that its members have firsthand exposure to the next, best tools for clients and agents.